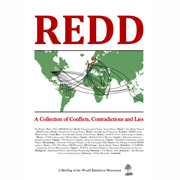 REDD: A Collection of Conflicts, Contradictions and Lies presents summaries of reports from 24 REDD projects or programmes with a common characteristic: they all show a number of structural characteristics that undermine forest peoples’ rights, or fail to address deforestation. As offset projects, they all fail to address the climate crisis because by definition, offset projects do not reduce overall emissions: emission reductions claimed in one place justify extra emissions elsewhere. What is needed, however, are overall reductions – and steep ones, in particular in industrialized countries. Offsets by definition cannot help achieve that goal, they are a distraction. In this publication, the terms forest carbon offset and REDD project are used interchangeably because all projects referred to in this publication were designed to generate carbon offset credits. Projects that predate the introduction of the term ‘REDD’ (Reducing Emissions from Deforestation and Forest Degradation), while not using the term in their original project descriptions, at later stages of implementation made reference to the concept of ‘REDD’. Hence both terms are used to refer to projects aiming to restore or maintain forest through generation of carbon credits that can be marketed to raise funds for project implementation.